Beyond fabulous platforms with a great retro-inspired vibe. 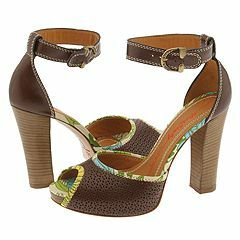 Leather upper in reptile-metallic finish or smooth with laser cut-outs. Contrast trim. Adjustable quarter straps. Lightly padded insole. Stacked heel. Leather sole.